the ewok event today is ridiculous. Level 75 ewoks wiping my team like it's nothing. I'm coming to the end with this game. I just think it's a mess. Ooh I wonder how we get him. I'm hoping for a Resistance event..
First Order event. No way I'll be able to get them all to 5* in time for the unlock. Oh well, at least it gives me a reason to beef up my Kylo. Pilot and stormtrooper are a very long farm. Wouldn't even come close to finishing them for this event. I have FO Stormtrooper, Officer and Tie Pilot all at 6 stars and level 8 gear. Might get the officer up to 7 star in time. Kylo and Phasma are already 7 star. Are we allowed to recruit in here? If you're looking for a guild that is a bit more casual, let me know. Just looking for active people to accrue tickets so we can do more raids. How many stars does the gaf guild make on Territory Battles? I'm thinking of bailing from my current guild because it's a bit too casual for my liking, and we don't do that good in TB. 15 stars each time I think. We did 18 the first go, and 22 the second. Our Platoon Mission completion is improving this third go round, but we could use more dedicated daily members. Note that the return of the Thrawn event is not listed, but it is expected for October. Who do we need for the Thrawn event? What type of squads? 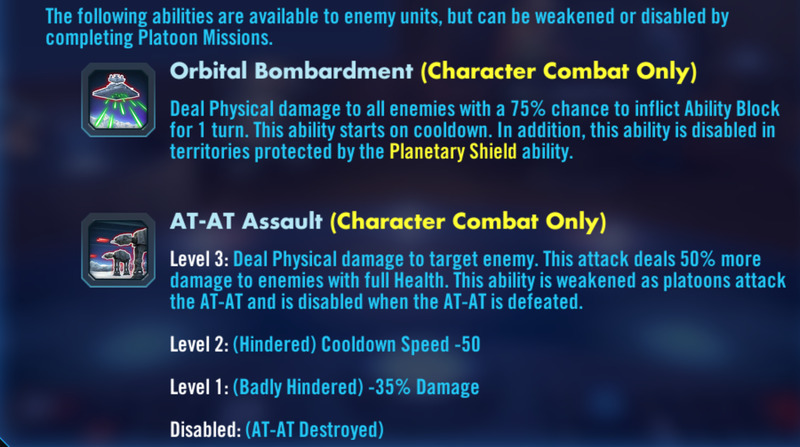 You'll need Phoenix Squad toons for the Thrawn event. 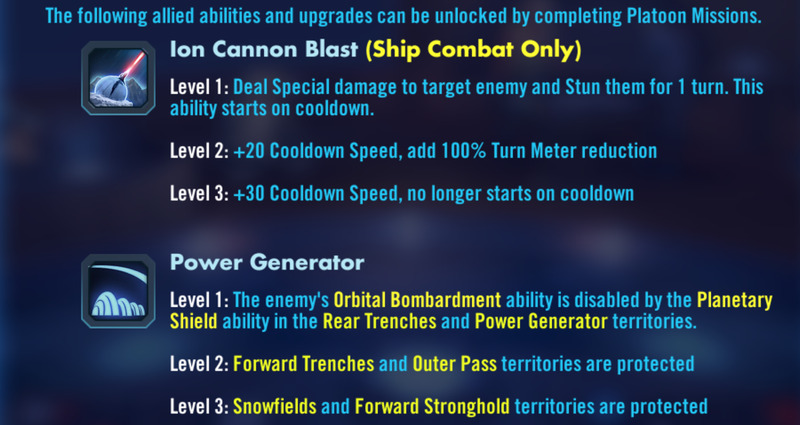 5 - seven star Phoenix toons will be needed to unlock seven star Thrawn. When it said the ships would be in cantina thought it would be nodes not just shipments. 6* Home One is still eluding me too, though I have the Executrix and Endurance both at 6. Might try putting it on auto and hoping the RNG gods smile upon me. What's a good way to go about determining who to zeta first? I know this has to be a common question people are tired of, but even just some advice to chew on for the decision would be appreciated. The three choices I'm bouncing between are Finn, Kylo, and R2. Finn of course because of the Resistance team's usefulness in various modes, but the issue is I haven't even unlocked him yet (though I could fast-track that). Kylo and R2 I do almost have ready for theirs, but their usefulness across the game seems less in comparison (R2's moreso). I'm leaning toward Kylo, but wanted to hear some thoughts on the matter before I pull the trigger. I thought about Vader for Rancor, but I don't know if that's even worth it anymore. A success is a success! Grats. Unlocked him at 5* today and I'm excited to find ways to make him fit my teams. I'm giving up for now, but I'll get them all to G10 or G11 by the next time he returns. In the process of trying I moved a bunch of MODS around, and now its more messed up than ever. At some point I will need to go through the task of redoing the MODS for all of my toons, but I don't have that in me right now. EDIT: Just been accepted in to to the Gaf clan! Thanks so so much ;D I'm stoked! 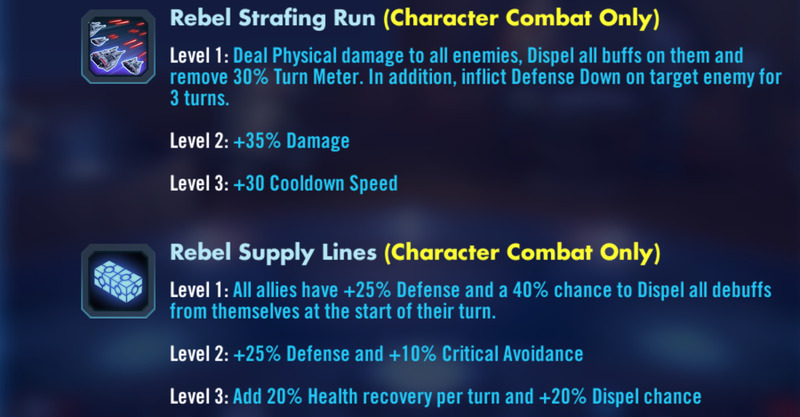 I just zeta'd Jyn for TBs. I have 2 left. I'm thinking Finn and saving the other for the off-chance they improve Aayla, Emperor or someone else I use. I'd zeta Kylo, but he's only a 4* G8. I think he hit the nail in regards to 'having' to schedule in times in your life to play a mobile game, first year of the game it wasn't like this at all, it was simply pull your phone out and have a game. But it's been slowly drifting towards that the past 12 months. Can anyone suggest which mods are best for ech Pheonix character? Thank you. Been playing this game since june now. Finished my rebels squad to get the emperor. Finished my empire squad to get r2d2 at the end of the month and now working on old ben, leia and farmer luke for CLS at the start of december. Didnt know there was a gaf clan, is there a lot of peeps in it? Currently full at 50/50, but we occasionally get members dropping off. 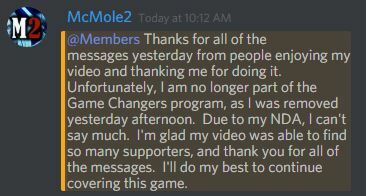 So this guy apparently got removed from the "Game Changers" program (players selected by EA to promote content) because of his video. Given the fair and constructive feedback, this is pretty pathetic. do you guys have a discord for the gaf guild? i'm looking to join once this round of tb is over. He has since come forth and admitted that the video is not why he was removed, and that he purposely mislead people to get angry for him. 5 Nightsisters at 5-stars for earning Talzin shards in Defense of Dathomir. When you 7-Star Talzin, you can get zetas from doing the bonus tier. 5 Ewoks at 4-stars to earn Wicket shards in the AT-ST event. When you have 7-Star Wicket, you can get zetas from doing the bonus tier of that event. 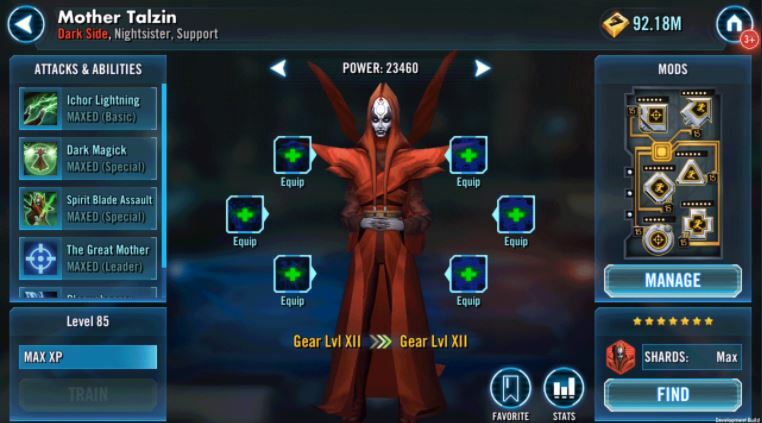 Nightsisters/Phoenix for the new Assault Battle (Secrets and Shadows) - lots of highly requested gear and sith shards. 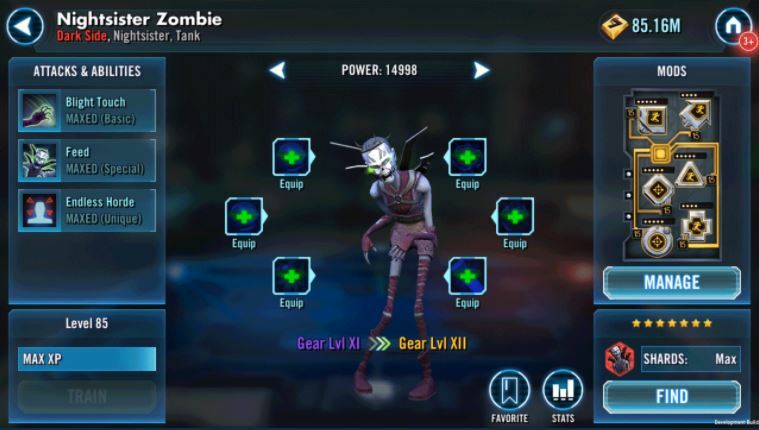 5 Nightsisters (I recommend G8+) for Advanced Tactics, again, helping get gear everyone's been requesting. 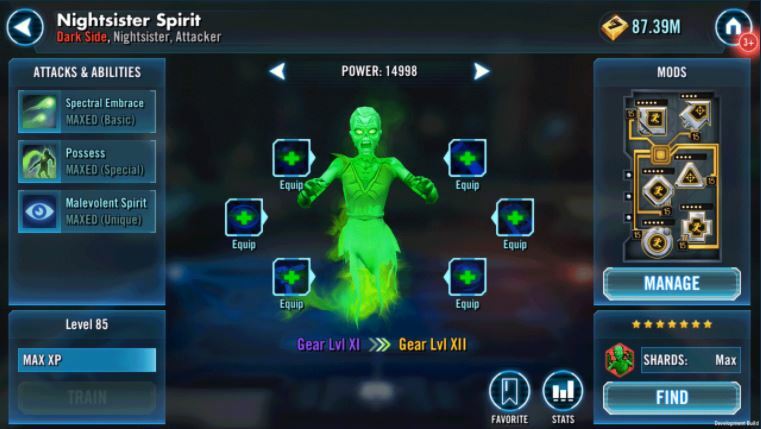 Zombie and Spirit come from the Ghosts of Dathomir event. If you're level 80+ you will get them both the first time you win. If you're under level 80, you'll instead get a few shards and a huge XP reward the first time to help you level up. Why try to rile people up? That's a bad look for him from both CG and the player's perspective. He says he did it because he "acted with full emotion not thinking clearly". Would like to join the Discord. Could I get an invite? Damn I can't believe I never thought to check for a thread for this game before. I play it constantly. Oh well. But I zeta'd Qui Gon today, every happy! I know this thread is pretty dead, but just wanted to let everyone know we have a few spots open in the NeoGAF guild for this game. Send me a PM or post here if you're interested! Guild is NeoGAFFI Sticks if you search for it, but let me know you applied or your application may get rejected. Is this totally dead now?